Last edited by Sven; 30-08-2011 at 11:16. Ahmed Apimah Barusso is getting huge wraps in Serie B and I think we signed him for June 2007... possibly unconfirmed yet. Last edited by acerвιc wιт; 04-05-2007 at 17:10.
i dont knoe milan loaned to many player to other club..
Wow , I didn't know they had that many players who are loaned out , from where did you found all that data ? If you think that is a lot, check out Juve's list. They own every 12 year old in Europe it seems. The World will always be Red & Black....But Europe is Red & Gold. Triunfa España! Los yunques y las ruedas cantan al compás del himno de la fe. Not many of them will be useful to us next season anyway. Maybe Marzoratti but with Cafu renewing that is looking unlikely. And Abbiati would be a good substitute. Abbiati is a good goalkeeper, i remember the days when he was our first choice - i preferred him over Dida a long time ago. However Dida proved to be a better GK and carlo decided to loan Abbiati, since he's too good of a player to rot on the bench. 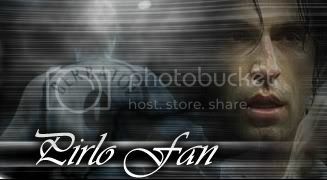 He even played for Juventus a season or so ago, when Buffon got injured in a match against Milan. I suggest we loan him again or sell him. Doesn't deserve the bench. 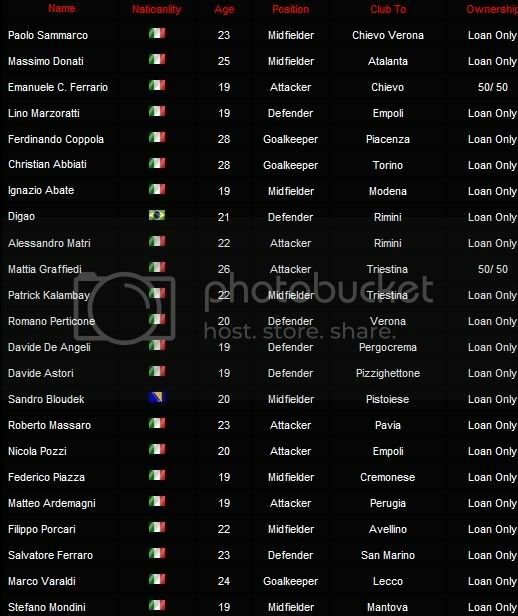 Milan have many players loaned out of which we don't know about. I received the information on www.planetmilan.com for all who were wondering. I'd recall Pozzi, Marzoratti and possibly Donati for next season. Sammarco apparently has had a decent season as well at Chievo. He was injured on October 28, 2006... 4 months out so he should be back by now. Luca Antonini, who is co-owned with Sampdoria and on loan at Ascoli, is having a good season. Impressed with him. I have no idea why Milan keep rights to Donati. Very obvious he won't amount to much, unless he pulls a Doni or Corini and begins to find world class-like form after the age of 29. Pozzi and Marzoratti should be called back. I would call back Pozzi .. he scored some wonderful goals for Empoli .. at this moment he is far better than Boriello..
Just heard that Boriello may leave for Livorno in the end of season ( channel4 )..
Our list of loaned players compared to the others club is very small.. Inter , Juventus , Roma are far ahead of us at this point.. He is football’s Mohamed Ali – he floats like a butterfly, stings like a bee. so we have have agreed to sign barusso i never knew that, can somebody confirm this please. You know when Donati joined us ,everybody predicted a big future for him but ended up on loans every season.I didn’t have a chance to see many Atalanta games this season but they say he is having a good season so maybe we should give him another chance before cutting him loose completely. Last edited by Edi; 05-05-2007 at 17:22. Abbiati, he's still great goalkeeper and he's gonna great sub for dida. Lino Marzoratti, I've seen him in Empoli he seemed good and he's young, he can be great. Pozzi, Awesome games on Empoli shirts. I want him back,.